Priest Roben, who was the de facto founder of Todaiji, came back to Kanagawa in 752 at the age of 48, shortly after the consecrating ceremony of the Great Buddha at Todaiji was over. First thing he did in Kanagawa was to climb Mt. Oyama, literally "a great mountain" and highly revered by the locals, where he found a stone statue of Fudo Myo-o, or Acala-vidyaraja in Skt. Interpreting it was a divine revelation, he made up his mind to found a temple (not a shrine) right on top of the mountain. He practiced asceticism in the mountain for three years. Getting the emperor's approval, he finally built a temple and named it Ukosan Daisanji . In the early Kamakura Period (1185-1333), Yoritomo Minamoto (1147-1199) , the founder of the Kamakura Shogunate, patronized the Shrine and dedicated a holy sword to Sekison Gongen every year, praying for continued luck in arms. On the record is the fact that in 1192 he visited the Shrine and prayed that Masako Hojo (1156-1225), his wife, might have an easy delivery. Entering the Hojo Era in 1219, however, the Hojo Regents did not give as much support to the Shrine as Yoritomo had been, and the Shrine began to go downhill. It was Priest Gangyo (?-1295), who restored the declining Shrine, or rather the temple to be exact. He was a Shingon Sect priest of Sen'nyuji in Kyoto, which had long been the temple for the Imperial Family before the Meiji Imperial Restoration of 1868. Unable to tolerate the sight of the half-desolate temple, he determined to restore it. 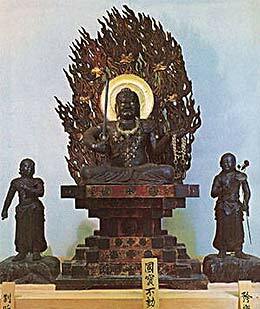 Collecting necessary alms and funds, he rebuilt the temple and made two iron-cast statue of Fudo Myo-o during the 1261 to 1274 period. The temple was founded on request of 聖武天皇 Shomu Tenno as a chokugan-ji 勅願寺.
. Chokuganji 勅願寺 Chokugan-Ji, "Imperial Temple" . (The cliffs at the Roben waterfall were considered deities, see below). From July 27 to August 17 at Afuri Shrine. 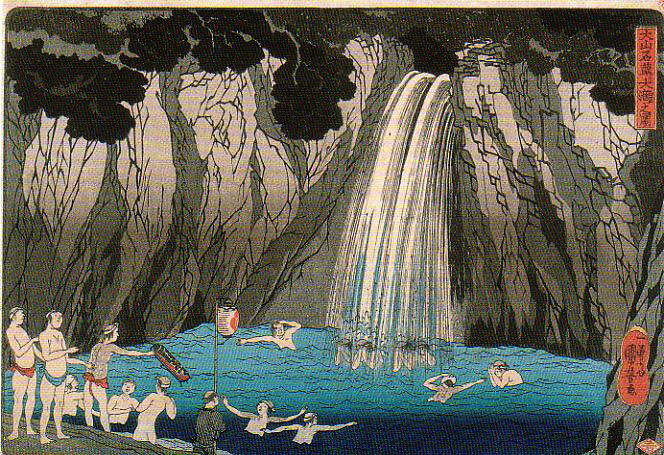 Mount Oyama was famous for its rain rituals during the Edo period. is a unique festival held on mount Oyama in the Tanzawa mountains in Kanagawa. Mount Oyama is 1,252 metres high and has long been regarded as a holy mountain and object of worship. A sacred Shinto mikoshi is carried from the Afuri jinja, which is located on the top of Mount Oyama, first to the lower shrine on the side of the mountain, and then on down to the shrine office at the very foot of the mountain; a distance of 8km. The people carrying the mikoshi are dressed in all white Heian period (794 -1185) clothing and the attendants are dressed in various traditional Heian and Edo period dress. Traditional instruments accompany the procession. The highlight of the event is watching as they ascend the steep slopes of Oyama and then on down the winding roads of the mountain town at the base. A traditional Shinto Kagura dance is performed and a special Oyama Noh performance is held in the evening. It was revered by Minamoto no Yoritomo as well as the Hojo clan, Ashikaga clan, and Tokugawa clan, and prospered during the Edo period when it was popular to visit Mt. Oyama.
. Ooyamatsumi no kami 大山祇神 .
. Raijin and Ikazuchi 雷神 Gods of Thunder .
. Takaokami no Kami 高おかみ神 God of Rain .
. Rain Rituals and Prayers (amagoi 雨乞い) .
. Kurikara Fudo 倶利伽羅不動剣 . One of the three important Fudo Statues in the Kanto region. But the biggest is the Great Fire Ritual in February 28, when five places are fired all at once. It used to be my favorite ritual when I was still living in the area. This was a special day every year indeed. See below for more.
. Seated Fudo Statue - National Treasure . On a cold morning in February many people gather here to celebrate the fire rituals on five altars. (This makes the inside quite warm, by the way.) The Heart Sutra is chanted over and over again until the last wooden piece with a wish or promise is burned to ashes. You can get quite in trance with all the incense and holy smoke in the small dim-lit hall. The statue of Fudo in the background seems to dance with the flames. All is very un-earthly after a while you are completely soaked into this mysterious realm. If you have time, go there on February 28 of any year. It starts around 10, so get up early. I went there every year while I lived in Kamakura. Day of the Winter Solstice. 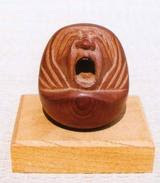 Some talismans and amulettes are sold online. Wooden Tablet with Fudo in his incarnation as a Dragon around a sword. Keyholder to protect those born under his star. To get deliverance from a curse of a dead or living soul, you have to pray to Fudo Myo-O. The ritual is called "Tsuina Tokubetsu Kitoo". You find the cost of this ritual performed expecially for you here on the link given below. It can be more than 300 dollars, if your adversary is a real fiend. 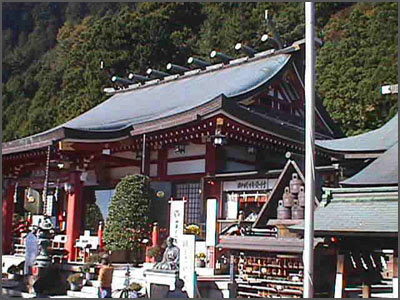 At Oyama in the city of Isehara, there are temples and shrines where people have been praying since ancient times. In particular, Oyama has been both a destination for religious purposes and for tourism as well since the 17th century, when the people of Edo started visiting. One of the reasons behind the popularity of Oyama has been the priests known as “oshi” who visited many areas encouraging people to visit Oyama. They performed spacial purifying rituals before the ascent of the mountain and offered special amulets to their followers. This paper discusses the emergence of oshi, lay religious specialists who contributed to the spread of regional pilgrimage cults in the Tokugawa period, by focusing on the example of Oyama, Sagami Province. Over the course of the seventeenth century, Oyama's oshi developed gradually as successors of shugenja and shrine priests who had lost much of their authority to the Shingon temples on the mountain in the first decade of the seventeenth century. In the second half of the seventeenth century the tradition of mountain asceticism largely disappeared from Oyama. The former mountain ascetics of Oyama needed new means of income, forcing them to run inns and develop parishes throughout the Kanto region. These parishes, from which most of Oyama's pilgrims came, became the single most important source of income for Oyama. The system spread from areas near Oyama across the entire Kanto region. It was these oshi who sustained the bonds between parishioners and the mountain by making annual visits to their parishes and providing accommodations for pilgrims. Despite their conflict-laden genesis, the oshi were not in constant opposition to Oyama's Shingon temples. 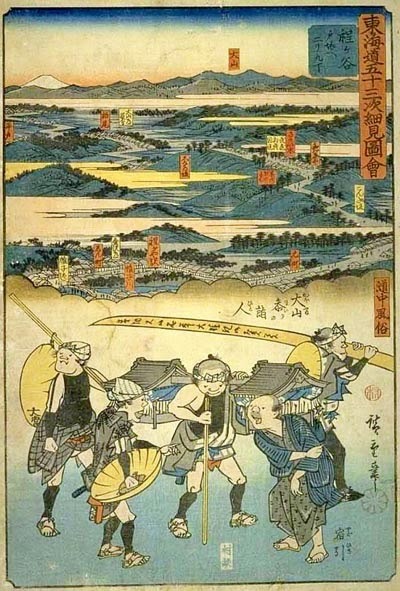 They developed customary networks with temples to handle pilgrims and received licenses from the head Shingon temple of the mountain, Hachidai-bo, which helped them to distinguish themselves from their competitors in neighboring villages. Another reason why the oshi did not voice a united opposition to the temples was that they were a fairly diverse group with different lineages and levels of wealth. which also helped to keep the groups (koo　講) together till our times. Often when they distributed their amulets, they got soy beans or other vegetables as offerings, and thus could offer tofu and vegetarian meals at their lodgings. After praying and getting relief at the temple, you can walk down the mountain to the cable car. On the way are more stone statues of various deities. Scroll through all the 36 temples. Ooyama Fudo in Kanagawa Pref.
. Temple Todai-Ji 東大寺 - Nara . In former times from June 28 till July 7.
. Katsushika Hokusai 葛飾北斎 . Roben practised austerities here in the year 755. At that time, the waterfall was about four meters high. This hokku is from the ninth month (October) of 1819, the year evoked in Issa's Year of My Life, when Issa was living in his hometown. 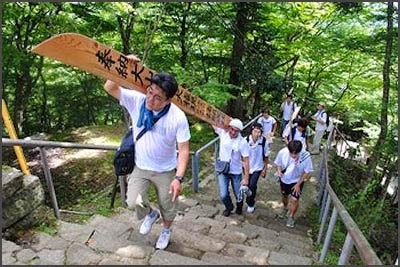 The hokku appears in a fairly similar form in Year of My Life, where it has a note, On a pilgrimage to Ooyama Shrine, which indicates that it is about a group of pilgrims going to the Sekison Shrine on Mt. Ooyama, about fifty miles from the city of Edo, where Issa lived for many years. 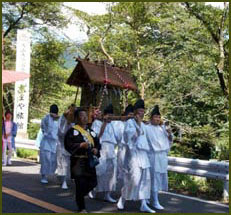 The main time of year for making pilgrimages to the shrine was between lunar 6/27 and 7/17, when the whole mountain became open to the public, and thousands of small groups of pilgrims representing larger groups or kou traveled to the mountain and were able to climb up it and present their offerings and prayers directly to the mountain god. Traditionally the mountain was believed to be a site where the souls of ancestors returned to this world, but it was also believed to respond to prayers for rain. In addition, warriors offered precious swords to the god there when they prayed for success. In Edo, the god of Mt. Ooyama was extremely popular among commoners during Issa's time, and groups of a hundred or more believers sprang up in many neighborhoods and among many professions, especially among carpenters, construction workers, blacksmiths, and firemen, and each year a different small group of members would be sent to the mountain to pray on behalf of all of the members, with expenses paid by offerings made by the whole group. 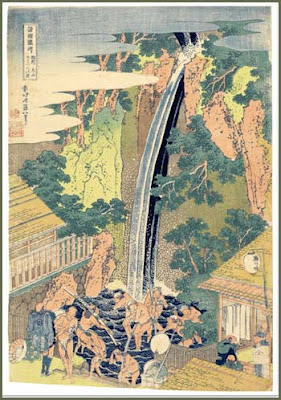 Issa's hokku evokes one such group, perhaps as they set out from Edo to make their pilgrimage to Mt. Ooyama. By Issa's time commoner pilgrims had begun to present large wooden swords to the Ooyama god, Sekison Gongen, who was believed to be pleased by swords, which were commonly mentioned in Buddhism as a tool for cutting through illusions and attachment to the world and also in popular shamanism, where spiritually powerful swords were regarded as a means of protection against malevolent spirits. Some pilgrims carried short wooden swords, but it was believed that the pleasure of the mountain god increased with the size of the wooden sword, so many groups began to carry and present very long wooden swords, which had the name of the god written on them and represented the prayer of the whole group. The sword in the hokku is eighteen feet long, so it is probably being carried on the shoulders of two pilgrims. When they get to Mt. 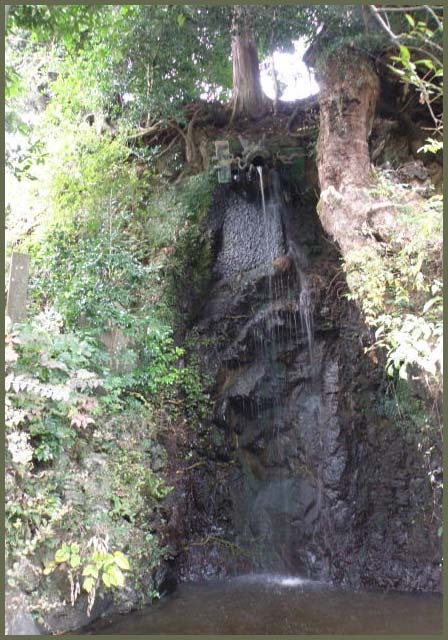 Ooyama, the pilgrims will enter a nearby river or perhaps the falls at the foot of the mountain in order to purify themselves and the wooden sword before meditating and then climbing the mountain and presenting the sword to the god. After they present the sword, they will be given a different wooden sword presented earlier by other pilgrims which has already been accepted and blessed by the god, and this sword they will take back to Edo and place in the shrine in the hall or room where the whole group periodically meets. In the version of this hokku in Year of My Life, the sword is "25 or 30 feet long," although this may be a deliberate exaggeration by Issa. Judging from the placement of the hokku among other hokku in Year of My Life, Issa seems to be skeptical that greater sword length is related to greater sincerity or greater power of prayer. 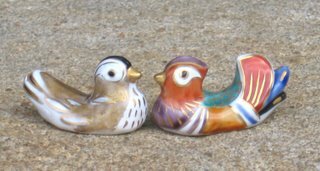 After all, the number of times one repeats Amida Buddha's name is much less important than the condition of one's heart/mind as one says the name. Still, Issa seems to be impressed by the great efforts made by the pilgrims on their journey. By mentioning the seemingly minor detail that the pilgrims wear thick summer robes -- usually worn in early summer, when it is cooler -- Issa stresses rather tactually the fact that after a few miles of walking the long sword must feel very heavy on the pilgrims' shoulders. * The custom at Ooyama of receiving a wooden sword presented by another person after you presented your own wooden sword to the god suggests the presence of an important element linking the culture popular pilgrimages and the culture within which renga and renku emerged and flourished.
. Shrine Hibita Jinja 比々多神社 . Pilgrimages to 36 Fudo Temples in Kanto (Bando) .